In terms of epicness, this just might be the most epic comic we’ve done. There’s so much going on. The second panel is my favorite. 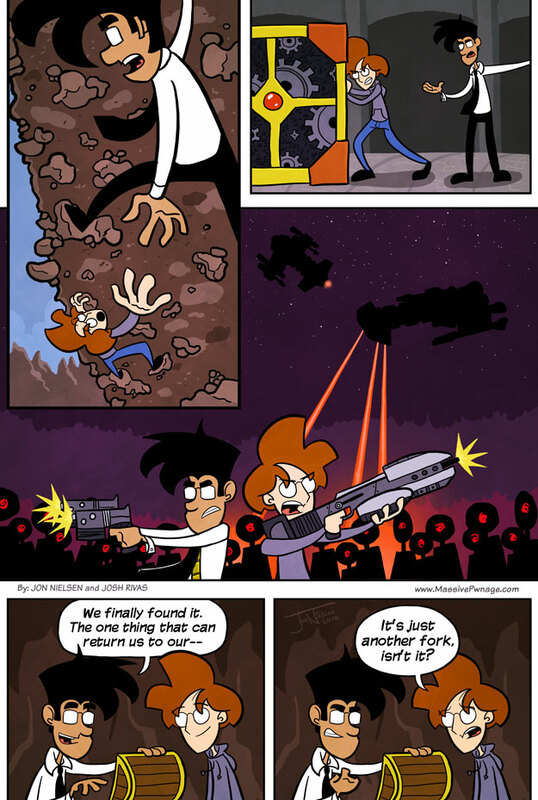 This entry was posted on Monday, October 4th, 2010 at 12:00 am and is filed under Comics. You can follow any responses to this entry through the RSS 2.0 feed. Both comments and pings are currently closed. that second game, i know it… but i cant remember, first is iceclimbers and third is halo right. The second one looks like Trine. And you should make an “Edit” feature for your posts. In case a spelling nazi fails on spelling a word. The the ships in the sky in the third panel are definitely from Starcraft 1. The dudes on the ground, I do not recognize them. The figures attacking Locke and Ence remind me of a cross between the spider robot things from Jonny Quest and the Anti-Spirals. DO NOT TELL ME THOSE ROBOTS ARE TERMINATORS! Very cool comic visually, but I don’t get the fork joke…. … think of all the XP they’ll have after all this. ._. The Battlecruiser scene might be worth a wallpaper.